"I came up with recipe since I couldn't find many for this cut of beef (also known as a culoutte steak or bottom round sirloin). It was very easy to make and tender." Rub roast all over with thyme, basil, marjoram, mustard, salt, and black pepper. Place meat in a sealable plastic bag, seal the bag, and refrigerate, 8 hours to overnight. Pour red wine into bag with meat 4 hours before cooking. Preheat oven to 450 degrees F (230 degrees C). Drizzle olive oil all over the bottom of a roasting pan. Place meat in the prepared roasting pan. Roast in the preheated oven for 15 minutes. 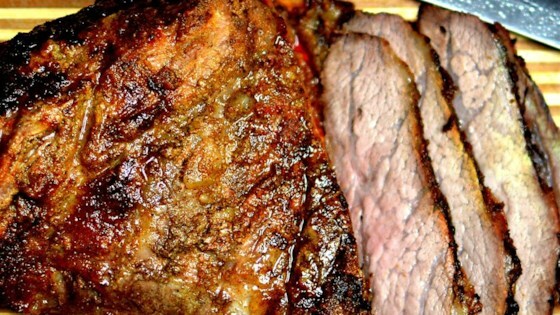 Reduce oven temperature to 350 degrees F (175 degrees C) and continue roasting meat until hot and slightly pink in the center, 20 to 25 minutes more. An instant-read thermometer inserted into the center should read 140 degrees F (60 degrees C). Let rest for 5 to 10 minutes before thinly slicing against the grain. This easy mix of spices makes your roast something truly special. No changes to the recipe. This is a very good and easy recipe. I did bake in a cast iron skillet...made mashed potatoes and fresh corn on the cob...doesn't get much better than that!!!! Very easy prep and cooking! I added granulated garlic to the rub and more wine to keep it moist, just because I had over 2.5 lbs of meat.